The 2016 Standing Liberty Quarter Gold Coin has a mintage limit of 100,000 coins from the U.S. Mint. 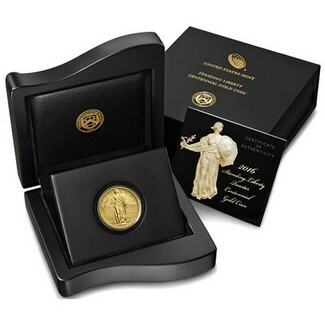 This is the Second of three 24-karat gold coins the Mint is issuing this year to commemorate the 100th anniversary of three classic coin designs first issued in 1916. The obverse (heads) features Liberty holding a shield and olive branch as she steps through an opening in a wall bearing 13 stars. Inscriptions are “LIBERTY,” “IN GOD WE TRUST,” “AU 24K,” “1/4 oz.,” and “2016.” The reverse (tails) depicts an eagle in flight flanked by 13 stars. Inscriptions are “UNITED STATES OF AMERICA,” “E PLURIBUS UNUM,” and “QUARTER DOLLAR.” Coin arrives in original Mint issued packaging.